That Arsene Wenger, always in a mood, isn't he? Here he is on the left, Angry of Old Trafford, resorting to the bottle after his Arsenal charges have a late equaliser chalked off. Manchester United ran out 2-1 winners after the Gunners had nosed in front. 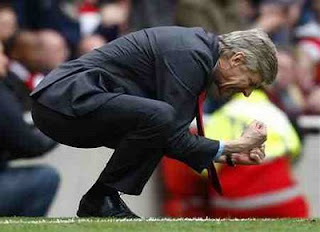 His conduct on the touchline can bring on constipation in even the most casual observer - at fifty paces! 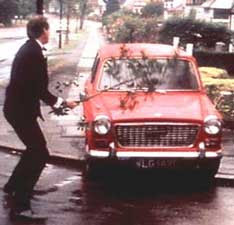 It seems each time Wenger's on telly, he appears to me like Basil Fawlty the day his car wouldn't start. His interviews are terse and he's dispensed with even the relative charm of "I did not see vee incident." "Right, that's it. I've had enough of y-o-o-o-ou!" Wenger insisted the bottle-kicking was over his frustration at the Gunners failure to equalise rather than the refereeing decision! Very subtle: only seasoned bottle-kickers would be able to tell. Referee Mike Dean sent Wenger off, and the Alsatian didn't know where to sit. Boss Ref Keith Hackett later apologised to the Arsenal manager. Hackett's carefully worded apology went something like, "Sorry Professor, I know Mike looks like Jasper Carrott, so he sometimes gets carried away. Seriously though, he's going to do himself an internal mischief. I worry for Arsene's sanity. In Wenger's Doctor We Trust? I hope not. I know the top managers employ the language of siege mentality to gee up their players - but Wenger's allegations are increasingly unhinged in their delivery. Wenger's strops and temper must surely be expressing an inner turmoil. How much more pressure can one man take? Arsenal need to keep winning or they'll be carrying Wenger out in a straitjacket - at an away stadium near you soon! 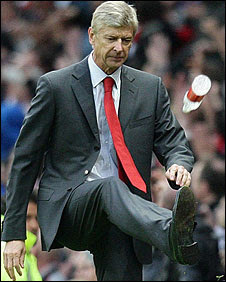 The gunners were robbed i would have kicked the bottle then the ref.